The new building of the Energy Academy Europe (EAE) simply had to be as energy-efficient as possible. A host of technologies have been used to achieve this. One of them is the arrangement of solar panels on the roof. Old and new technologies have been used in the EAE building to reduce its energy consumption. Geothermal heating and natural ventilation keep the temperature constant, and later this year solar panels will be installed on the roof to generate energy. Although commonplace nowadays, their arrangement on the roof of the new EAE building will be revolutionary. The building’s sloping roof faces south at an angle to ensure optimum light intensity. The roof has a surface area of 4,000 m2, but the solar panels will only cover half of this. Although this may not sound efficient, the other half has been used for windows, which bring in natural light and thus save on artificial light. Groups of solar panels will be placed in a triangular configuration on the roof. The individual panels will be installed at varying angles, with the top panel in each triangle flat and each successive one at a slightly greater angle. The result will look somewhat like a fan. Although it will be appealing to look at, the arrangement has been chosen for a reason: by placing the solar panels at different angles on the roof, you achieve optimum light intensity on the panels throughout the day. 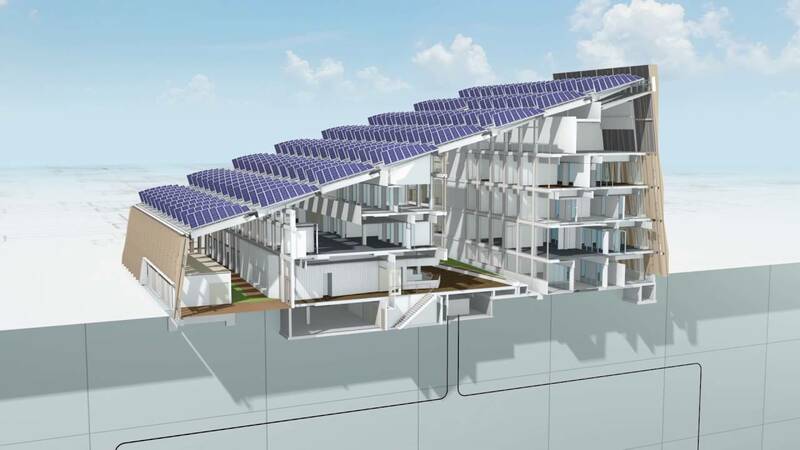 The energy output will be 37% higher than a regular 2000 m2 roof covered with flat solar panels. According to project managers Pieter van Hoesel and Martin Kranenborg, this configuration is unique in Europe. The idea came to them at a conference on solar panels in Paris. Such an arrangement had already been proposed, but no one had investigated it further. Van Hoesel and Kranenborg set about installing a test configuration to find out whether the idea would be more efficient than a standard configuration. They also looked at whether some makes of solar panel were more efficient than others. As the solar panels will be placed in the triangular configuration, the shadow of some panels will fall on other ones at times. A computer simulation showed that the shadows would not seriously affect the electricity production. The conclusion was that the entire configuration would be more efficient than a flat roof with solar panels. Why would it be more efficient? With this arrangement the output from the solar panels is spread throughout the day. As the segments of the solar panels are placed at different angles, one section always faces the sun at some point during the day. The output from the vertical panels is highest in the morning and evening, whereas the output from the panels that are at more of an angle is higher in the middle of the day. This is because the light intensity is highest when a panel is perpendicular to the sun. If all the solar panels are flat, the average energy output is lower. In short, the design means that more can be achieved with familiar technology. Solar panels can be even more efficient without any revolutionary developments or inventions. The solar panels are expected to be installed on the roof in March or April at the latest. From that point on the building really will be energy neutral. All this technology and much more has earned the building an ‘Outstanding’ rating in the Building Research Establishment Assessment Method (BREEAM). This means that it is exceptionally good in energy saving and generation. Text: Hedwig Doornbosch and Kris van Noord. This article was written as a placement assignment in the course unit Education and Communication, Faculty of Science and Engineering. Last modified: 05 December 2017 09.36 a.m.